The spot, which depicts people struggling to eat a burger using chopsticks, has been attracting debate on social media. 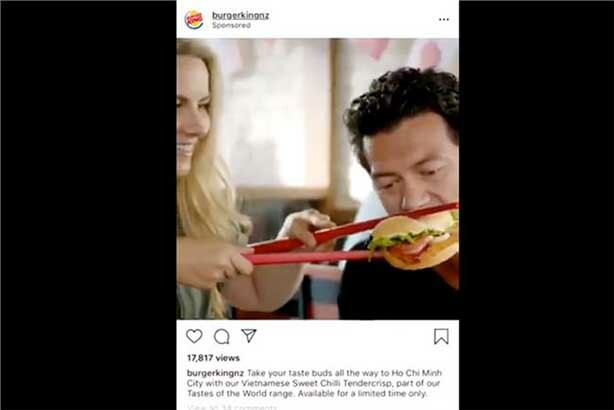 A short Instagram video designed to promote Burger King New Zealand's Vietnamese Sweet Chilli Tendercrisp burger is being widely discussed on social media. The film shows people trying to eat the burger using oversized chopsticks, angering many viewers who feel it makes fun of an important cultural tradition. "I'm so sick of racism. Of any kind," Maria Mo, a Korean-New Zealand pianist, wrote. Her post of the video on her Twitter feed on 4 April has been viewed 2.11 million times so far. "Because I couldn’t believe such blatantly ignorant ads are still happening in 2019, it honestly took me a second to work out what the heck I was looking at," she told The Huffington Post. Mo's post sparked a debate about the ad's intentions and overtones. Some have labelled it insensitive and stereotypical, while others, including Vietnamese users, have defended its sense of humour and say they don't find it offensive. Burger King has not yet made any official comment. The response echoes the reaction provoked by a Dolce & Gabbana ad released in China in November showing an Asian model trying to eat Italian food such as pizza and spaghetti with chopsticks, while being tutored by a male narrator. Retailers including department store Lane Crawford dropped the brand following the outcry and, despite an official apology from Stefano Dolce and Domenico Gabbana, there are signs that the damage inflicted on the brand is ongoing. Burger King NZ appears to have now removed the ad from its social media feed. It has not responded to Campaign's request for comment. Campaign understands that VMLY&R is the brand's agency of record.